The White Snake Sage tells Boruto and Sarada to acquire scales called “Gekirin” from the wild serpent Garaga. As they travel through Ryuchi Cave to get the Gekirin, an enormous snake appears before them. 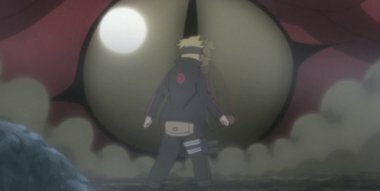 This snake was in fact Garaga, but Boruto and Sarada find themselves in a tough spot, overwhelmed by its size and ferocity. Meanwhile, Moegi from Team 10 reports back to Konohagakure. From her report, it seem that somebody who acquired knowledge of the village’s top-secret information may be related to Mitsuki’s disappearance.